Sadly, Tiger & Co. have gone out of business and we can no longer supply this item. 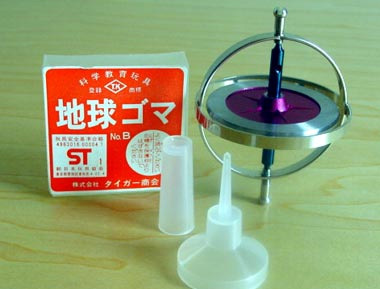 These unique gyro-tops (chikyu goma) can be used for fun or as an educational toy in the classroom or at home. Our gyroscopes can be used to explain the principles of gyrocompass, gyrostabilizer and auto-pilot as well as the rotation of the Earth, a satellite in orbit, the flight of intercontinental ballistic missiles, the four seasons, how to find true North and South and how to determine latitudes. These gyroscopes are suitable for both children and adults alike. Tiger & Co., Ltd have been producing quality educational toys in Japan since 1921: "All our Chikyu Goma are carefully tested by our factory before shipment, we guarantee that they are in first-class condition." Each gyroscope comes with complete operating and maintenance instructions in English, Spanish and Japanese. Plus a two-part plastic pedestal and launching twine. For sets and gyroscope wholesale orders, please contact us. NOTE: All our gyroscopes must be shipped by EMS. If you select regular airmail, there will be a delay as we will need to bill you for the additional cost of shipping by EMS.